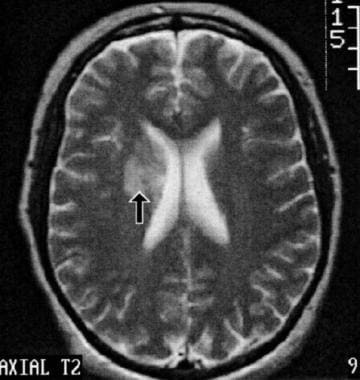 This axial, T2-weighted brain magnetic resonance image (MRI) demonstrates an area of ischemia in the right periventricular white matter of a 41-year-old woman with longstanding systemic lupus erythematosus (SLE). She presented with headache and subtle cognitive impairments but no motor deficits. Faintly increased signal intensity was also seen on T1-weighted images, with a trace of enhancement following gadolinium that is too subtle to show on reproduced images. The distribution of the abnormality is consistent with occlusion of deep penetrating branches, such as may result from local vasculopathy, with no clinical or laboratory evidence of lupus anticoagulant or anticardiolipin antibody. Cardiac embolus from covert Libman-Sacks endocarditis remains less likely due to the distribution. See also Pediatric Systemic Lupus Erythematosus, Neonatal and Pediatric Lupus Erythematosus, Systemic Lupus Erythematosus and Pregnancy, Discoid Lupus Erythematosus, Bullous Systemic Lupus Erythematosus (BSLE), Acute Cutaneous Lupus Erythematosus (ACLE), Subacute Cutaneous Lupus Erythematosus (SCLE), and Physical Medicine and Rehabilitation for Systemic Lupus Erythematosus. The pathophysiology of SLE has not been defined fully, although many genes that affect immune function, particularly the human leukocyte antigen (HLA), may augment susceptibility to clinical disease. Most monozygotic (identical) twins are discordant for clinical SLE, strongly suggesting that additional factors, probably environmental, trigger the widespread development of autoimmunity in susceptible individuals. Certain medications (e.g., phenytoin, hydralazine, procainamide, and isoniazid) may produce drug-induced lupus, but this disorder differs from classic SLE in its autoantibody profile (e.g., antihistone antibody positive) and in sparing the kidneys and CNS. Once triggered, SLE's autoimmune reaction affects many sites through multiple mechanisms such as deposition of immune complexes, effects of cytokines and other chemical neuromodulators, direct attack by autoantibodies or activated leukocytes, and others. Non-neurologic sites of damage include the renal glomeruli, joints, pleural or pericardial serosa, integument, cardiac or vascular endothelium, cardiac valves, and the oral and conjunctival mucosa. Multiple sites may be involved within the nervous system. In areas of apparent vasculitis, histology demonstrates degenerative changes in small vessel walls, often with minimal or no inflammatory infiltrates. Chronic effects of immune complex deposition offer one potential mechanism for SLE vasculopathy; cytokine-mediated effects on vascular endothelium or local brain parenchyma are another. Inflammatory and noninflammatory SLE vasculopathies may be clinically indistinguishable. The terms cerebritis and vasculitis are well embedded in the literature and will be used in this article, keeping in mind the evolving understanding of the underlying processes. In addition to small vessel vasculopathy, inflammatory changes may occur in large- to medium-sized vessels, giving a more classic vasculitis, sometimes with clinical stroke syndromes resulting from local thrombosis or artery-to-artery emboli. Other potential stroke etiologies include local thrombosis from antiphospholipid antibodies, which may involve small or medium-sized arteries or veins, including the venous sinuses. Antiphospholipid antibodies comprise one category of the multiple autoantibodies that may be associated with SLE. In addition to their association with LSE and local arterial or venous thrombosis, these antibodies also may be associated with a hemorrhagic diathesis, myelopathy, and non-neurologic manifestations such as spontaneous abortion. Dural sinus thrombosis is a rare complication of SLE-associated hypercoagulability and is often seen in association with antiphospholipid antibodies. Radiologically, flow defects in one or more venous sinuses may be imaged with MRI, MR venous angiography, conventional angiography, or radionuclide brain scanning. Associated edema or hemorrhagic infarcts may be obvious on MRI or CT scans. The most common type of drug-induced myopathy is steroid-induced myopathy. It usually presents with progressing painless muscle weakness, fatigability, and muscle atrophy, and is an adverse effect of glucocorticoid use (though fluorinated glucocorticoid has a higher chance of causing this). Amphiphilic drug myopathies are often caused by drugs with hydrophobic moiety and hydrophilic region containing amine group. They produce multisystem disorders including neuropathy, myopathy, and cardiomyopathy. Chloroquine and hydroxychloroquine cause vacuolar myopathy, often given in a 500 mg daily dose of chloroquine for 1 year or longer. At extracellular pH, this drug is poorly ionized and penetrates membranes. With acid pH in lysosome, cationic region interacts with polar materials. Neurologic complications worsen prognosis, especially in the presence of refractory seizures, encephalopathy, or paralysis from stroke or myelopathy. Honczarenko K, Budzianowska A, Ostanek L. Neurological syndromes in systemic lupus erythematosus and their association with antiphospholipid syndrome. Neurol Neurochir Pol. 2008 Nov-Dec. 42(6):513-7. [Medline]. Hawro T, Bogucki A, Sysa-Jedrzejowska A, Bogaczewicz J, Wozniacka A. [Neurological disorders in systemic lupus erythematosus patients]. Pol Merkur Lekarski. 2009 Jan. 26(151):43-8. [Medline]. Greenberg BM. The neurologic manifestations of systemic lupus erythematosus. Neurologist. 2009 May. 15(3):115-21. [Medline]. The American College of Rheumatology nomenclature and case definitions for neuropsychiatric lupus syndromes. Arthritis Rheum. 1999 Apr. 42(4):599-608. [Medline]. Hanly JG, Urowitz MB, Su L, Bae SC, Gordon C, Wallace DJ, et al. Prospective analysis of neuropsychiatric events in an international disease inception cohort of patients with systemic lupus erythematosus. Ann Rheum Dis. 2010 Mar. 69(3):529-35. [Medline]. [Full Text]. Steup-Beekman GM, Zirkzee EJ, Cohen D, Gahrmann BM, Emmer BJ, Steens SC. Neuropsychiatric manifestations in patients with systemic lupus erythematosus: epidemiology and radiology pointing to an immune-mediated cause. Ann Rheum Dis. 2013 Apr. 72 Suppl 2:ii76-9. [Medline]. Borowoy AM, Pope JE, Silverman E, Fortin PR, Pineau C, Smith CD. Neuropsychiatric lupus: the prevalence and autoantibody associations depend on the definition: results from the 1000 faces of lupus cohort. Semin Arthritis Rheum. 2012 Oct. 42(2):179-85. [Medline]. Unterman A, Nolte JE, Boaz M, Abady M, Shoenfeld Y, Zandman-Goddard G. Neuropsychiatric syndromes in systemic lupus erythematosus: a meta-analysis. Semin Arthritis Rheum. 2011 Aug. 41(1):1-11. [Medline]. Mina R, Brunner HI. Pediatric lupus--are there differences in presentation, genetics, response to therapy, and damage accrual compared with adult lupus?. Rheum Dis Clin North Am. 2010 Feb. 36(1):53-80, vii-viii. [Medline]. [Full Text]. Kamphuis S, Silverman ED. Prevalence and burden of pediatric-onset systemic lupus erythematosus. Nat Rev Rheumatol. 2010 Sep. 6(9):538-46. [Medline]. Kampylafka EI, Alexopoulos H, Kosmidis ML, Panagiotakos DB, Vlachoyiannopoulos PG, Dalakas MC. Incidence and prevalence of major central nervous system involvement in systemic lupus erythematosus: a 3-year prospective study of 370 patients. PLoS One. 2013. 8(2):e55843. [Medline]. Taddio A, Rossetto E, Rosé CD, Brescia AM, Bracaglia C, Cortis E, et al. Prognostic impact of atypical presentation in pediatric systemic lupus erythematosus: results from a multicenter study. J Pediatr. 2010 Jun. 156(6):972-7. [Medline]. Ishimori ML, Pressman BD, Wallace DJ, Weisman MH. Posterior reversible encephalopathy syndrome: another manifestation of CNS SLE?. Lupus. 2007. 16(6):436-43. [Medline]. Mikdashi J, Krumholz A, Handwerger B. Factors at diagnosis predict subsequent occurrence of seizures in systemic lupus erythematosus. Neurology. 2005 Jun 28. 64(12):2102-7. [Medline]. Joseph FG, Lammie GA, Scolding NJ. CNS lupus: a study of 41 patients. Neurology. 2007 Aug 14. 69(7):644-54. [Medline]. Keane JR. Eye movement abnormalities in systemic lupus erythematosus. Arch Neurol. 1995 Dec. 52(12):1145-9. [Medline]. Hernando Rubio I, Belzunegui Otano J, Máiz Alonso O, Alvarez Rodríguez B. Transverse myelitis and bilateral optic neuritis in a patient with systemic lupus erythematosus. Reumatol Clin. 2012 Sep-Oct. 8(5):298-9. [Medline]. Zou X, Zhuang Y, Dong FT, Zhang F, Chen YX. Sequential bilateral central retinal artery occlusion as the primary manifestation of systemic lupus erythematosus. Chin Med J (Engl). 2012 Apr. 125(8):1517-9. [Medline]. Lee JH, Sung IY, Park JH, Roh JL. Recurrent laryngeal neuropathy in a systemic lupus erythematosus (SLE) patient. Am J Phys Med Rehabil. 2008 Jan. 87(1):68-70. [Medline]. Iannuccelli C, Spinelli FR, Guzzo MP, Priori R, Conti F, Ceccarelli F, et al. Fatigue and widespread pain in systemic lupus erythematosus and Sjögren's syndrome: symptoms of the inflammatory disease or associated fibromyalgia?. Clin Exp Rheumatol. 2012 Nov-Dec. 30(6 Suppl 74):117-21. [Medline]. Sanna G, Bertolaccini ML, Cuadrado MJ, Laing H, Khamashta MA, Mathieu A, et al. Neuropsychiatric manifestations in systemic lupus erythematosus: prevalence and association with antiphospholipid antibodies. J Rheumatol. 2003 May. 30(5):985-92. [Medline]. Azarpazhooh MR, Mokhber N, Orouji E, Chambers BR, Hatef MR, Rezaieyazdi Z, et al. Microembolic signals in patients with systemic lupus erythematosus. Can J Neurol Sci. 2010 May. 37(3):371-5. [Medline]. Ellis SG, Verity MA. Central nervous system involvement in systemic lupus erythematosus: a review of neuropathologic findings in 57 cases, 1955--1977. Semin Arthritis Rheum. 1979 Feb. 8(3):212-21. [Medline]. Yuan H, Ni JD, Pan HF, Li LH, Feng JB, Ye DQ. Lack of association of FcgammaRIIIb polymorphisms with systemic lupus erythematosus: a meta-analysis. Rheumatol Int. 2010 Mar 19. [Medline]. AlSaleh J, Jassim V, ElSayed M, et al. Clinical and immunological manifestations in 151 SLE patients living in Dubai. Lupus. 2008. 17(1):62-6. [Medline]. El-Chennawi FA, Mosaad YM, Habib HM, El-Degheidi T. Comparative study of antinuclear antibody detection by indirect immunofluorescence and enzyme immunoassay in lupus patients. Immunol Invest. 2009. 38(8):839-50. [Medline]. Merkel PA, Chang Y, Pierangeli SS, et al. The prevalence and clinical associations of anticardiolipin antibodies in a large inception cohort of patients with connective tissue diseases. Am J Med. 1996 Dec. 101(6):576-83. [Medline]. Choojitarom K, Verasertniyom O, Totemchokchyakarn K, et al. Lupus nephritis and Raynaud's phenomenon are significant risk factors for vascular thrombosis in SLE patients with positive antiphospholipid antibodies. Clin Rheumatol. 2008 Mar. 27(3):345-51. [Medline]. Offenbacher H, Fazekas F, Schmidt R, Freidl W, Flooh E, Payer F. Assessment of MRI criteria for a diagnosis of MS. Neurology. 1993 May. 43(5):905-9. [Medline]. Zanardi VA, Magna LA, Costallat LT. Cerebral atrophy related to corticotherapy in systemic lupus erythematosus (SLE). Clin Rheumatol. 2001. 20(4):245-50. [Medline]. Castellino G, Padovan M, Bortoluzzi A, et al. Single photon emission computed tomography and magnetic resonance imaging evaluation in SLE patients with and without neuropsychiatric involvement. Rheumatology (Oxford). 2008 Mar. 47(3):319-23. [Medline]. Valdés-Ferrer SI, Vega F, Cantú-Brito C, et al. Cerebral changes in SLE with or without antiphospholipid syndrome. a case-control MRI study. J Neuroimaging. 2008 Jan. 18(1):62-5. [Medline]. Glanz BI, Laoprasert P, Schur PH, et al. Lateralized EEG findings in patients with neuropsychiatric manifestations of systemic lupus erythematosus. Clin Electroencephalogr. 2001 Jan. 32(1):14-9. [Medline]. Coles A. Looks like multiple sclerosis, but the ANA is positive: does my patient have lupus?. Pract Neurol. 2004. 4(4):212-221. Pittock SJ, Lennon VA, de Seze J, Vermersch P, Homburger HA, Wingerchuk DM. Neuromyelitis optica and non organ-specific autoimmunity. Arch Neurol. 2008 Jan. 65(1):78-83. [Medline]. Trevisani VF, Castro AA, Neves Neto JF, Atallah AN. Cyclophosphamide versus methylprednisolone for the treatment of neuropsychiatric involvement in systemic lupus erythematosus. Cochrane Database Syst Rev. 2000. CD002265. [Medline]. Fernandes Moça Trevisani V, Castro AA, Ferreira Neves Neto J, Atallah AN. Cyclophosphamide versus methylprednisolone for treating neuropsychiatric involvement in systemic lupus erythematosus. Cochrane Database Syst Rev. 2013 Feb 28. 2:CD002265. [Medline]. Jónsdóttir T, Gunnarsson I, Risselada A, et al. Treatment of refractory SLE with rituximab plus cyclophosphamide: clinical effects, serological changes, and predictors of response. Ann Rheum Dis. 2008 Mar. 67(3):330-4. [Medline]. Ermann J, Bermas BL. The biology behind the new therapies for SLE. Int J Clin Pract. 2007 Dec. 61(12):2113-9. [Medline]. Looney RJ. B cell-targeted therapies for systemic lupus erythematosus: an update on clinical trial data. Drugs. 2010 Mar 26. 70(5):529-40. [Medline]. Weinshenker BG, O'Brien PC, Petterson TM, et al. A randomized trial of plasma exchange in acute central nervous system inflammatory demyelinating disease. Ann Neurol. 1999 Dec. 46(6):878-86. [Medline]. Crowther MA, Ginsberg JS, Julian J, et al. A comparison of two intensities of warfarin for the prevention of recurrent thrombosis in patients with the antiphospholipid antibody syndrome. N Engl J Med. 2003 Sep 18. 349(12):1133-8. [Medline]. Wallace DJ. Improving the prognosis of SLE without prescribing lupus drugs and the primary care paradox. Lupus. 2008. 17(2):91-2. [Medline].